Chris Moneymaker is the man who put modern online poker on the map. So if you are browsing our website now, chances are that without Chris you may browse a site about blackjack instead. His parents must have been very proud when Chris won the 2003 WSOP No-Limit Texas Holdem main event, because with such a Moneymaker last name, he finally made it a meaningful name worse having. Chris Moneymaker was the first poker player of the new wave of young players who made their teeth online before entering and conquering the live poker arena. 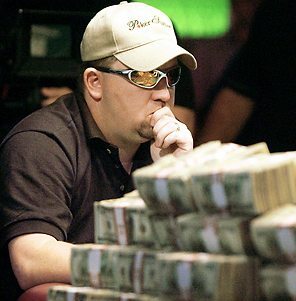 Before the 2003 WSOP, Chris Moneymaker was a total unknown on the poker scene. Then he decided to download pokerstars. He played in a $39 satellite at pokerstars and won a seat at the 2003 WSOP Main Event. When he played at the WSOP in Las Vegas, this was the first time ever that this by then accountant had played at a live poker tournament. Chris won the tournament and its $2.5 million first prize when his 54o landed him a boat by the river, versus the runnner-up Sam Farha's top pair. After becoming world champion, Chris Moneymaker quit his day job and became a member of pokerstars' team of pros. This was a natural development given how much money he had made from this initial satellite at pokerstars, and given how much recognition pokerstars would get from being the catalyst of the so-called "Moneymaker Effect", i.e. the ensuing boom of online poker. Moneymaker has had some success in the following years in his career as a professional poker tournament player. He has finished in the money 4 times at the WSOP, 2 times at the WPT (finishing second at the Shooting Star event in 2004) and once at the EPT. As Chris Moneymaker is a Team PokerStars member, you may get a chance to play him heads-up if you qualify at one of the VIP promotional events. When asked what qualities Chris thought he had that helped him become world champion, he said that he had good math ability to calculate pot odds (he was an accountant after all) and an excellent memory (remembering players tendencies is key). Finally he said that it helped that he came from a family of gamblers, as it is better to have some gamble in your blood (the willingness to take calculated risks) for winning big.